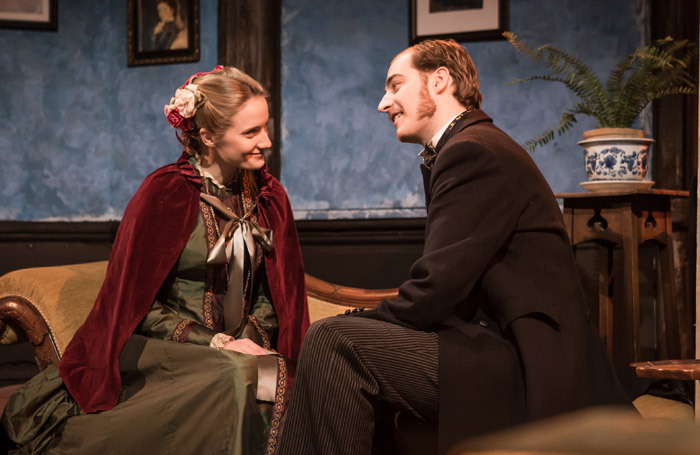 In honour of the 150th anniversary of the foundation of the Finborough Arms building, the west London pub theatre is presenting a series of plays from 1868. First up is Cyril’s Success (most recently performed in 1890), a comedy by HJ Byron, prolific author of melodrama, burlesque (as in pastiche) and pantomime, now resident in the nearby Brompton Cemetery. Cyril Cuthbert (Tim Gibson) is a young literary man with his fingers in a number of pies (plays, novels, newspaper serials), whose success and creative temperament leads him to neglect his wife Catherine. Cue quarrels, misunderstandings, jumping to conclusions, and elements of melodrama resolved as comedy. Hannah Boland Moore’s production is good-natured and generates a good deal of gentle laughter, though some of the arch asides feel a touch awkward. Among the cast, Susan Tracy takes top honours as Catherine’s vinegary former teacher Miss Grannet, who escaped from a day-long marriage 22 years earlier and rather than “pin her grievances to her bonnet”, belligerently advocates the advantages of spinster life. Isabella Marshall portrays the aggrieved Catherine with wit and delicacy and Stephen Rashbrook and Lewis Hart offer entertaining support as Cyril’s friends Pincher and Titeboy. While a more detailed look at Victorian literary society might be appreciated by modern audiences, this revival serves as a taste of all the fun that can be had rummaging around in the archives for long forgotten plays, and indicates that there is much to look forward to in this season of rediscoveries. Entertaining and pleasingly brisk revival of a melodramatic Victorian comedy of manners.